Maximize your dorm room storage space! Soft bottoms won't scratch University provided dorm items! Dorm Co. Tip: Keep your makeup, writing utensils, and other dorm essentials organized! Dimensions: 4" diameter x 4"
Cosmetic brushes require more care than other cosmetic dorm items. You need to keep the bristles in good condition otherwise you're going to be buying an awful lot of brushes over and over again. Plus you don't want to get the inside of your makeup dorm trunk dirty with the leftover powder and lip gloss that's on your makeup brushes. 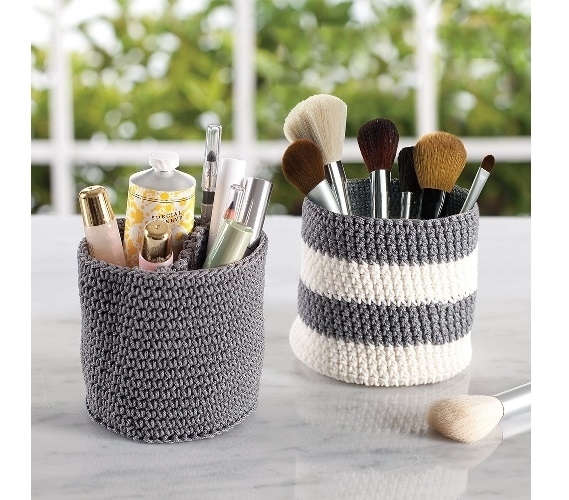 Avoid a mess in your makeup college trunk and keep your makeup brushes in good condition with our Hand Knit 2 Piece Mini Dorm Organizers! Our Hand Knit Mini Dorm Organizers come with two dorm organizers so you can keep your brushes organized. One of these dorm essentials is even divided so you can keep eyeliner and lip gloss separated or keep your lip gloss brushes separate from your powder brushes. Instead of makeup you could even keep your pens, highlighters, and other college supplies in these handy dorm necessities. Or you could use one dorm caddy for makeup brushes and one for your dorm desk college supplies! Use your imagination with these cute dorm essentials! 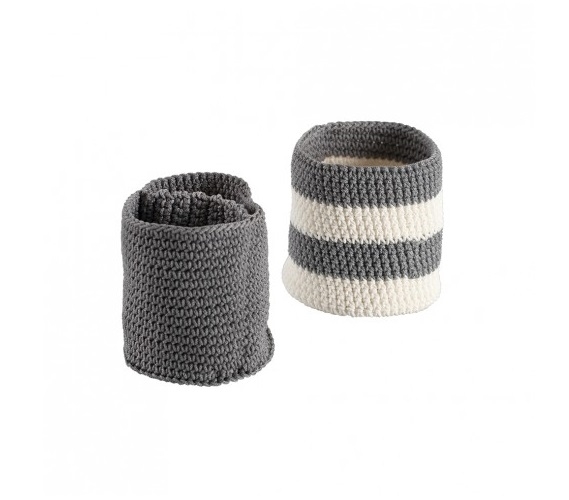 They even add to dorm room decor with neutral gray and white colors that will go with any dorm room decor theme!